As one of the largest and most successful private universities in Indonesia, BINUS is hosting 128 students from countries across the globe for this Spring Semester 2018, and would be delighted to welcome you Fall 2018 and future semesters. For us, it’s all about making the students experience worthwhile! If you are a student of one the BINUS’ partner institution, please contact your home university coordinator(s), please ask them to nominate you no longer than the deadline mentioned in order to start the application process. To check whether your home university is partner of BINUS, please click here. 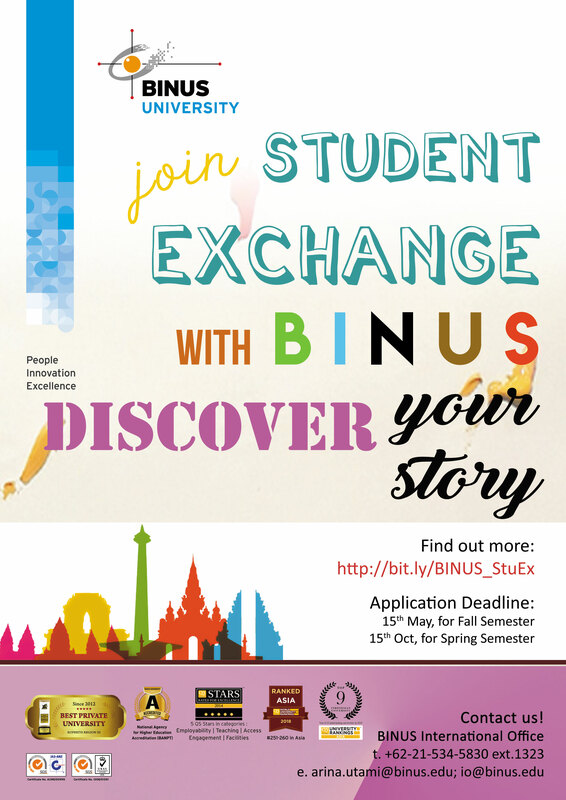 ISEP Exchange, swap spots with a student from BINUS student. ISEP Direct, just meet our application requirement and placement is guaranteed. Customize your needs with affordable fees and let the experience begins. Other English proficiency score/proof is also accepted such as a statement letter from home university confirming student is enrolled in a program taught fully in English. BINUS has several campuses across the Java Island, and at this moment only these campuses which are delivered in English. On the above link contain course list of four sheets of different campuses; students must choose only ONE campus based on the most matched course selection. BINUS Square – Hall of Residence. Please find the Info Sheet and Application Form in the above mentioned link. BIPA 101: this is a fee paying non-credit course. Lesson is on practical daily life Indonesian. Program consists of 12 lessons (each 90 minutes). Indonesian Language Course: this is a credit course. More details will be shared once course is finalized and it will be included in the updated course list. Feel the REAL professional environment in well-acclaimed institutions, with mentoring or supervision from our faculty member and transferable credit. We offer Internship for international students with the possibility of free tuition upon nomination as an exchange student. Submit all the application documents and materials needed below through the International Office of home university or your ISEP Coordinator. Softcopy application and required documents have to be submitted via email to arina.utami@binus.edu.